Sussex have laid firm foundations for success in this year's Royal London One-Day Cup - but have plenty of hard work ahead too. Jason Gillespie’s men have won two of their opening three group games – and lost the other only by a very close margin. With different players finding their best form in each game, it’s sparked high hopes among fans that a top-three place and a shot at the Lord’s final could be within the Sharks’ reach. The latest success was a 75-run win in Somerset on Tuesday – the home county’s first defeat of the season. Luke Wright’s 87-ball 102 and half-centuries by Michael Burgess and David Wiese saw Sussex to 341 for seven. A brave reply from the Taunton hosts faltered when Ishant Sharma took three wickets to wrap up the win. That followed a seven-wicket Sussex win over Kent last Thursday and a narrow two-wicket loss to Hampshire on Saturday, both at Hove. Sussex host Middlesex on Friday and visit Gloucestershire on Sunday and Surrey on Tuesday. Head coach Gillespie was pleased with the Taunton win and said: “Somerset know this ground like the back of their hand – they’ve got some experienced players. We were well aware of that and just had to make sure we stuck to our plans and were disciplined, and that was the really pleasing thing, backed up by the lads in the field. 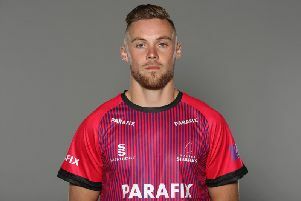 The Hants loss showed how one player’s contribution could be the difference between winning and losing as Gareth Berg scored a brisk 65 in the run chase. Gillespie vowed his players would learn from that.